Hiya friends! If you stepped into the World of Selenium, you must have run into Web Elements! Text boxes, buttons, links, checkboxes, radio buttons, dropdowns, alerts etc., everything is treated as a web element. Using locator types and strategies, we can easily identify any desired element on the page. This is the most crucial step for interacting with the page and referencing these elements further in the code. And yes, it is very similar to what we saw in Selenium IDE except for the syntax and the way the concept is applied. It is possible at all times to get hold of the desired element on the page programmatically but in order to achieve it, our creative side might have to take a peek. Reason, we don’t always have control over the HTML on the page. That’s why we have so many locator types and there is absolutely no reason to panic! Let us go ahead and see each locator type in detail with code examples. Id is the most useful and preferred way to locate an element on the page because it is unique. But, watch out! Some developers either auto-generate these ids or totally forget to include one. That is when we go for other locator types. Explanation: Locates the first element with the matching id attribute. Google Chrome – Right click on the web element whose ID is to be determined and select ‘Inspect’. Or open developer tools by clicking F12, click inspect element icon on the top left corner and then click on the desired web element on the page. Both methods will highlight the HTML code corresponding to the chosen element. 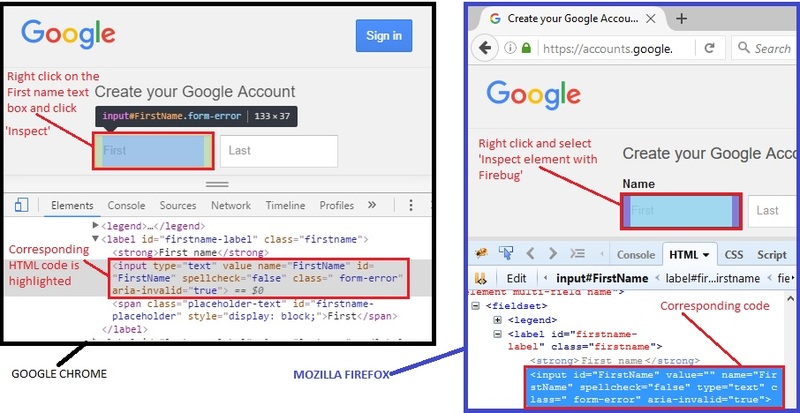 Mozilla Firefox – Right click on the web element and select ‘Inspect element with Firebug’ (In case you missed my post on Firebug installation and usage). Or just right-click on the element and select ‘Inspect element’ if you don’t really want to use Firebug. Corresponding HTML code will be opened and highlighted in both cases. Name attribute can also be used to locate an element on the page. Explanation: Locates the first element with the matching name attribute. Example: Let us identify the last name text box by name. Here we use the actual name of the tag like <a> for anchor and <table> for table. This turns out to be useful when we would like to get all the elements with a given tag name. In case the page under test has only one tag then findElement would work. But otherwise, it is adviced to index the result to locate the specific element we wish to work with. Explanation: Locates all the elements with the matching tag name. Example: Let us locate the ‘Sign in’ button on the top right corner of the Gmail account creation page. Right click on the button and click on inspect element to get the corresponding HTML code. We can see that it has an anchor tag. Let us go ahead and get all the web elements with the tagName “a” in a list and then locate the first element by its index in order to interact with ‘Sign in’ button. To avoid any unexpected surprises that you may encounter while trying out these locators, let us see a test case implementing the above locator types. import org.openqa.selenium.WebElement – to instantiate a new web element. import org.openqa.selenium.By; – This package references to the By class on which a locator type is called. The comments are clearly provided for each line of code and hence self-explanatory. Upon executing the test case, success is shown in green and the output is printed to the console confirming that the ‘Sign in’ button is located with tagName. The right half of the image shows the automated output executed in Firefox browser. First name and last name text boxes are filled with the values given in the code. Let us take a break here. In our following post, we will see three more ways to locate elements with examples. Munch on these thoughts until then!